1. Reduction of GHG emissions in every household. Programs that reduce, reuse and recycle municipal waste are effective and high-impact means of reducing GHG emissions. When discarded materials are recycled, they provide industry with an alternative source of raw materials from which to make new products. This results in less demand for virgin materials whose extraction, transport and processing are major sources of GHG emissions. Zero Waste solutions thus reduce emissions in virtually all extractive industries: mining, forestry, agriculture, and petroleum extraction. 2. Reduction of GHG emissions at the production line. Additional energy and associated emissions are saved in the manufacturing process, as recycled materials generally require less energy to be turned back into products. While “waste to energy” incinerators capture some of the energy embodied in materials that they burn, recycling the same materials conserves three to five times as much energy. This is particularly notable in products such as aluminum, where the direct energy use is reduced by 88% from that required to produce primary aluminum. Soil restoration with compost and increase of carbon sink capacity. Compost from green waste — everything from household food scraps to dairy manure — avoids methane emissions from waste disposal and most importantly, it contributes to soil restoration and helps increase its capacity to act as carbon sinks. Research shows that if compost was applied to just 5 percent of the California state’s grazing lands, the soil could capture a year’s worth of greenhouse gas emissions from California’s farm and forestry industries. The effect is cumulative, meaning the soil keeps absorbing carbon dioxide even after just one application of compost, as compost decomposition provides a slow release fertilizer to the soils leading to an increase in carbon sequestration and increased plant production. Reduction of GHG and toxic emissions from waste disposal. Zero Waste solutions also directly reduce GHG emissions and toxic pollutant releases from waste disposal facilities, which are a significant source of both. Burning waste emits carbon dioxide (CO2) and nitrous oxide (N2O); and landfills and dumps are a primary source of methane (CH4), as well as CO2. [7In fact, incinerators produce more carbon dioxide (CO2) per unit of electricity than coal-fired power plants. The average trash incinerator in the U.S. directly emits an average of 2.5 tonnes of carbon dioxide per MWh and 2.8 tonnes of nitrous oxide per MWh—both greenhouse gases that contribute to global warming. Burning waste also drives a climate changing cycle of new resources pulled out of the earth, processed in factories, shipped around the world, and then wasted in incinerators,landfills and combustion plants that use it as fuel, such as cement kilns. Zero Waste Solutions create green jobs and revitalize local economies. The recycling sector, with more than two million informal recyclers in developing country cities, offers climate-smart urban solutions to sustain and strengthen livelihood development, improve local environmental health, and strengthen local economies. By prioritizing people-led zero waste programs that are rooted in worker empowerment, community participation, and policies that are both farsighted and inclusive, zero waste solutions illuminate the path toward building sustainable waste management systems that work for both communities and the environment. It reinvigorates and develops our communities. Solving the waste and climate problem requires more than technical fixes: zero waste solutions are part of a larger web of decisions about health, equity, power, poverty, development, policy decisions and governance which require the participation and engagement of everyone. Waste is everyone’s business and zero waste programs can draw support from diverse constituencies who may otherwise not engage in climate-related work. Stern, Nicholas, A Blueprint for a Safer Planet. Bodley Head, 2009. USEPA, Solid Waste Management And Greenhouse Gases: A Life-Cycle Assessment Of Emissions And Sinks, 3rd Edition. 2006. Morris, “Comparative LCAs for Curbside Recycling, Versus Either Landfilling or Incineration With Energy Recovery.” International Journal of Life Cycle Assessment. (2005); 13(3) 226-234. Schlesinger, Aluminum Recycling. CRC Press, 2006. IPCC, AR4, Working Group 3, Chapter 10. Skumatz, “What Provides The Biggest Bang? Comparing Carbon Footprint Effects And Costs from Diversion vs. Energy Programs” presentation at California Resource Recovery Association, August 2008. “Astounding” levels of background radiation measured in some of the city’s poorly ventilated urban areas were almost a third higher than the world average, a former environmental protection official has revealed. Dr Mamie Lau May-ming, who retired as principal officer last year, measured background radiation with a Geiger counter at around a dozen points across the city last year, including Sham Shui Po, Sai Kung and Central. At one covered pedestrian bridge in Nam Cheong, radiation levels hit 0.32 microsieverts per hour and above – 36 per cent higher than the global average of about 0.25. Roughly the same readings were taken from the stairwells of an old Tai Kok Tsui primary school and a poorly ventilated office building corridor in Central. By contrast, recordings at the abandoned Japanese city of Tomioka-machi, near the tsunami disaster-hit Fukushima Daiichi nuclear plant, were 0.65 as of September, she said. Lau, a former member of the city’s Radiation Board, said the results were “astounding”. “Background radiation is a problem and few people are aware of it,” Lau told the Post. She said building clusters in close proximity could elevate the radiation levels considerably. The source was likely to be granite building materials including some concretes which contain traces of gamma radiation-emitting minerals such as radon, uranium and thorium. Although Lau said levels were not life-threatening – 0.23 microsieverts per hour is equivalent to 2 millisieverts (mSv) a year, or roughly one cranial CT scan – constant exposure in small doses could have cumulative effects. In Lau’s new book, Healing Tree, she points to the Petkau effect, which proves cell membranes are damaged much more readily by long-term exposure to low-level radiation than brief exposure at the same dose. The health risks to urban dwellers were also compounded by stress, imbalanced diets and unhealthy lifestyles, she said. About 38 per cent of the city’s background radiation comes from the air in the form of radon, a gas which enters the lungs as particles and cannot come out. She urged the government to strengthen management of indoor radon including using less radioactive materials for construction and giving more consideration to radon issues at the planning stage when redeveloping old areas. The Observatory, which monitors the city’s ambient radiation, says the level of background radiation in the city does not pose a high risk to human health. A Department of Health spokesman said in addition to man-made sources, ionising radiation came from natural sources in the soil, water and air. He added that even the International Atomic Energy Agency had no definite conclusion as to whether exposure to background radiation carried a health risk, “though it has been demonstrated at a level a few times higher”. The Buildings Department said it did not measure radioactive materials used in construction, nor did it have any regulations on their use. “It is believed the source of low-level radiation in buildings, if any, comes from the aggregate of the concrete,” a spokesman said. More than 100,000 retailers will fall under the scope of an expanded plastic bag levy scheme from tomorrow, but the government is only adding 58 officers to check whether shops are complying with the rule. Since 2009, shoppers have been required to pay at least 50 cents for each plastic bag at some 3,300 retailers citywide, mostly chain stores and supermarkets. A team of 10 officers from the Environmental Protection Department specialises in enforcing the law. The department had previously revealed that eight more officers would be added to that team. Yesterday, department director Anissa Wong Sean-yee said at a Legislative Council meeting that the department would recruit another 50 people to help inspect different shops. They would refer cases to the specialised law enforcement team, she said. Wong was responding to a question from Federation of Trade Unions lawmaker Wong Kwok-hing, who asked about the manpower to enforce the new bag rules. “Law enforcement officers in district offices will also pay attention to cases that need follow-up,” Wong said, referring to the department’s seven branch and regional offices. Edwin Lau Che-feng, head of community engagement and partnership at Friends of the Earth, agreed that a team of 58 supervisors would not be sufficient to monitor implementation of the bag-levy scheme, which includes myriad exemptions such as for items that require a bag for hygiene purposes. He predicted retailers selling both exempt and non-exempt items – such as supermarkets and food stores in which frozen food and other goods are sold – could see chaos at first. Adding to the confusion would be different charges imposed by different retailers. Ocean Park said it would charge between HK$1 and HK$5 for each plastic bag, depending on its size. Maxim’s Group said its Chinese restaurants would charge HK$1 per bag and HK$1 per plastic lunchbox. But its fast-food outlets and cake shops would charge 50 cents for each bag. Supermarket chains Wellcome and ParknShop will continue to charge customers 50 cents for each plastic bag. Both will still offer “flat-top” plastic bags free for exempted items, such as foods without packaging or in non-airtight packaging, and frozen or chilled foods. Aeon said it would provide plastic bags in six sizes in its department store and supermarkets. All would cost 50 cents. ParknShop said staff members at its stores had been trained and given clear guidelines on the new measure. Stores would also have in-store broadcasts and posters to remind customers and advise them to bring their own bags. Some retailers, such as fashion chain H&M, will switch entirely to paper bags in April. An H&M spokeswoman said the paper would be certified by the Forest Stewardship Council. Retailers who break the rules could be fined HK$2,000 or even prosecuted. The fine does not target customers. · Ocean Park: HK$1 to HK$5 for each bag, depending on its size. · Maxim Group: HK$1 per bag at Chinese restaurants and 50 cents per bag in fastfood outlets. I once wrote that Hong Kong must have the ability to identify and solve its practical problems. Since the end of Occupy Central, many now believe the 47 million mainland visitors are to blame for the city’s troubles. It is a fact that mainland visitors, along with their luggage, are causing overcrowding, especially on public transport. But do these visitors deserve all the blame, or is it partly due to ineffective policy? Despite the fact that the local public transport infrastructure is at peak capacity, there are grandiose plans in place, such as the high-speed rail link and the third runway, plus the newly built cruise terminal. It seems that injecting more visitors into Hong Kong is an economic policy that is taking priority over the quality of the lives of normal citizens, while also ignoring the sustainability of our public transport infrastructure. It is likely that more visitors will generate even more problems, since that will aggravate an already overloaded transport system. Imagine putting more people into a lift and ignoring the overload warning; it is a recipe for disaster. There are no overload warnings on buses or trains; everything seems fine on the surface. Hong Kong is proud to have a clean, safe and convenient transport system, the reason it received the award for “best city in the world for commuters” in 2014. The MTR Corporation has just announced a net increase in profits of 19.8 per cent, partly due to a record-breaking 4.5 per cent increase in ridership. On paper, large profits are made and there is no urgency to fix what is “not broken”, such as dramatically increasing train frequency or imposing strict restrictions against carrying large luggage during peak hours. It may come as a surprise to outsiders, then, that Hong Kong was ranked a lowly 70th in the world this month for quality of living. Commuting accounts for part of that living, a daily activity that is weaved into the working fabric of Hong Kong. With the public transport system responsible for moving millions across town each day, it is considered the lifeline of Hong Kong. That said, overcrowding on this very lifeline is like a clogged artery that is in dire need of attention. Overcrowding creates serious issues. The sheer number of people on each train can stop doors from closing, often taking two or three attempts to securely shut the door at each major station, resulting in delays and stress. Prolonged exposure to stress may contribute to sudden outbursts, anxiety and negative social effects. The recent protests and uploaded internet videos of arguments between passengers on trains and buses support the findings in American behavioural researcher John B. Calhoun’s rat study that overcrowding leads to increased aggression. During daily commutes, this stress is intensified. A study by US professor Drury Sherrod argued that a sense of control lessened the negative impact of a crowded environment. 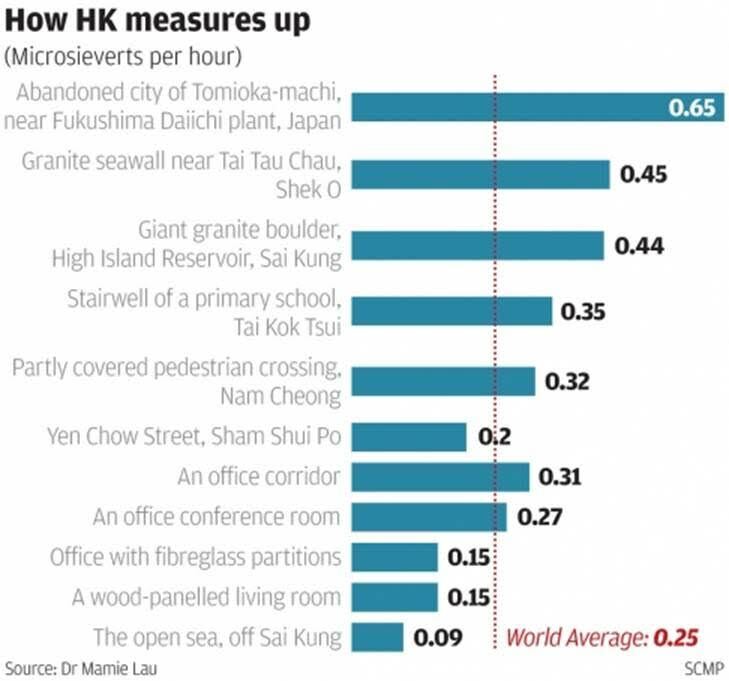 So, while Hong Kong is crowded in general, it is less likely to have a negative effect if one can always choose to escape the congestion and go hiking instead. By contrast, there is no control or choice over a regular commute to and from work. The lack of parking spaces and frequent traffic jams makes driving an unsuitable alternative and carpooling a challenge. In addition, tightly packed environments pose a serious health risk. Crowds can increase the likelihood of rapidly spreading a contagious disease due to reduced ventilation, and this is especially worrisome given the recent deadly flu outbreak. The adverse health effects caused by stress strains the public health system as well. According to a map of suicides from 2005 to 2010, higher rates of suicides were found in the northern areas of Hong Kong compared to Hong Kong Island. This finding is troubling. Difficulty in relocation due to the city’s exorbitant housing costs and the lengthy and more expensive commutes could be reasons for this geographical discrepancy. So one can hardly blame mainland visitors when the government has not taken drastic action. Large projects continue to dictate that more visitors must continue to come to Hong Kong, or the schemes risk becoming white elephants. This may be a path to more record-breaking profits for some, but the result of congested public transport is a serious health and social concern that affects everyone. There is no point in blaming or threatening mainland visitors when it is our border control and economic policy that require careful review. Enforcement of phase two of Hong Kong’s environmental levy on plastic bags – which kicks off today – will be flexible for the first month, an official said yesterday. Inspectors from the Environment Bureau would focus on explaining the scheme and asking for compliance over the next four weeks, political assistant for the Environment Bureau Michelle Au Wing-tsz told DBC radio. More than 100,000 retailers fall under the scope of the scheme from today – following an initial phase that covered around 3,500 retailers, mostly chain stores and supermarkets. A new team of 58 inspectors has been created, which will refer cases to the 10 officers in the Environmental Protection Department team who specialise in enforcing the scheme. Au admitted policing the second phase would pose a “challenge”, but she believed the city would get the hang of the new levy soon. “I think Hongkongers are smart; taking the first phase of the scheme, in 2009, as an example they caught on quite quickly,” she said. Au said plainclothes officers would be sent out to inspect retailers’ implementation of the scheme, alongside inspections by uniformed officers. A hotline by the department will answer public inquiries about the scheme and handle shoppers’ reports on any non-complying retailers. The first phase imposed a simple 50-cent charge on shoppers for each plastic carrier bag required. Now different retailers will charge different levies, and unlike shops in the initial phase, retailers included from today will not have to pass the cash on to the government. Aeon, which operates 13 supermarkets in the city, said that from today its small, free bags for fruit, vegetables and frozen items would be moved next to the cashiers to be distributed by staff. ParknShop said staff members at its stores had been given training and clear guidelines on the new measures. It would use its PA system and put up posters to advise customers about the new rules and remind them to bring their own bags. The Wing Wah bakery chain said it was putting up notices outside its stores listing the new levies on bags, which would range from 50 cents to HK$3. While the government has claimed the first phase a success, with the number of plastic bags going to landfills reduced by up to 90 per cent, figures show the number of plastic bags distributed has risen. In a reply to queries by the Legislative Council, the Environmental Protection Department said the number of plastic bags distributed by the city’s retailers in the initial phase rose from 13.46 million per quarter to 17.96 million between 2009 and the end of last year – an increase of 33.4 per cent. The number of retailers taking part in the initial phase rose 17.3 per cent to 3,534 over that period. Bag manufacturer Wing Kai Plastic Products, in Cheung Sha Wan, said orders for plastic bags had remained at the same level since the scheme began in 2009. A spokeswoman predicted the impact of the new levy on orders would be slight. The company said orders for paper bags, which are exempt from charges, had risen by 1 per cent lately. Retailers who break the rules could be fined HK$2,000. Shoppers are not targeted. An expanded plastic bag levy scheme starts on Wednesday, but are the city’s retailers ready? The frozen food store in Wan Chai where she works is one of more than 100,000 retailers that will fall under the scope of an expanded plastic bag levy scheme. From Wednesday, their customers will have to pay 50 cents per bag, just as they do now at 3,300 retailers, most of them chain stores and supermarkets. Government officials claimed the levy cut the number of plastic bags going to landfills by up to 90 per cent after its launch in July 2009. Unlike the initial scheme, the independent retailers affected by the expanded levy will not have to pass the cash to the government. All plastic bags – including bags with plastic handles – will fall under the expanded levy scheme, unless the goods they carry fall under a myriad of exemptions listed by the Environmental Protection Department. 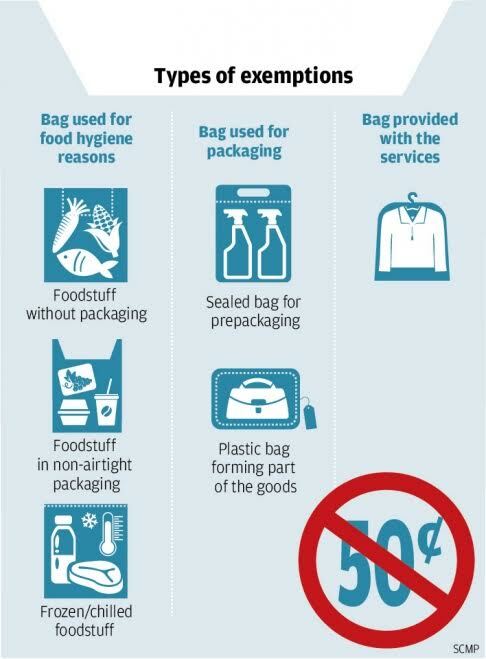 There will be no charge if a bag is needed for “hygiene reasons”, for example, or if it is part of a product’s original packaging. Some retailers have switched plastic for paper bags before the levy kicks in. However, despite a massive push by the department to educate the public and advertise the expanded levy scheme, retailers small and large are anxious about full implementation. A cashier at one high-profile retailer in Times Square, Causeway Bay, said the company had warned staff not to make more than three mistakes in bagging or face the sack. She said she was “very afraid” of making a mistake. Retailers who breach the rules could be hit with a fixed penalty of HK$2,000 or even prosecuted. A recent online survey of 500 Hongkongers by the World Green Organisation found that only 42 per cent of the respondents actually knew that the scheme applied to every retailer after April 1. “I think the government can definitely do more to teach us how to follow this new levying … it really is quite confusing, especially when we have to explain it to customers, many of whom are old,” the shopkeeper in Wan Chai said. She said she was not against the levy, but feared some of her elderly customers would not understand the purpose, refuse to pay the extra 50 cents and hassle them for free bags. Johnny Lam, of Johnny’s Stationery Store in Wan Chai’s Tin Lok Lane, will have to charge a levy almost every time he gives out a plastic bag. “It will be a bit inconvenient at first. To be honest, it will be particularly awkward forcing some of our regulars to pay 50 cents just for a bag,” Lam said. But he was hopeful the levy would deter those customers who “want bags for everything”, he added. Such problems do not faze Wan Yau-kwong, manager of frozen meats company Kwong Lee Trading. Wan said many customers already did without plastic bags by bringing their own, or wrapping meat in newspaper. He has not decided what to do with the takings from the levy, which stores are allowed to keep. “If it’s a lot of money, we may set up a charity box; if it’s not a lot we might just keep it,” he said. At Golden Eagle Dry Cleaning, in Causeway Bay, a staff member said the levy would have little effect, as bags used in providing a service were exempt. Few customers would need another plastic bag to put their bagged, dry-cleaned clothes into, she said. “Many people will just give out the bags secretly, but we won’t … we don’t want to take the risk of being fined by the government,” said the woman, who helped run the store. Big companies were also preparing for the levy. Aeon Stores, which owns the Jusco supermarket chain, had prepared a “Q&A worksheet” to help frontline staff. A.S Watson, which owns ParknShop, Watsons and Fortress, said all store managers had attended briefing sessions and had provided clear training and guidelines to staff. The Executive Council’s hasty decision last week to approve the third runway has triggered a public outcry. Secretary for Housing and Transport Anthony Cheung Bing-leung has scrambled to justify this most expensive infrastructure project in the history of Hong Kong. However, his limited explanations have led to even more doubts. The most pertinent questions revolve around the city’s airspace entitlements. Flights leaving and approaching Chek Lap Kok are barred from crossing into the airspace immediately north of the border. This has severely restricted the number of planes the airport can handle. Cheung said Macau and the mainland had signed an agreement with Hong Kong to resolve the issues of congested airspace in the region up to 2020. But he refused to disclose details of the agreement, citing national security. This is ridiculous. Any consensus among the parties needs to be made known to the airliners and international aviation bodies before they can be put into practice. If Hong Kong was promised any concessions, the industry would need to be informed well beforehand, to prepare for the changes. None of the third parties have been notified. That can only mean the 2007 plan has nothing concrete for Hong Kong. Cheung’s secretive approach has only added to speculation that the agreement contains, at best, vague principles. Besides, whatever was written into the agreement is only meant to be valid until 2020, well before the third runway becomes operational in the mid-2020s. There is nothing in black and white that guarantees Hong Kong would be given the necessary air paths to ensure the success of the third runway. Airport Authority chief executive Fred Lam Tin-fuk said people should trust the Hong Kong and central governments to solve the problem. He is obviously unaware of the latest findings of the Hong Kong University’s public opinion programme released this week. Only 37 per cent of the people asked said they trusted the SAR government, while only 33 per cent said they trusted Beijing. Trust is in short supply when it comes to how Hong Kong people see their political masters. Lam is entrusted with overseeing the statutory body responsible for the operation and development of the airport. Taxpayers would have wanted a more prudent chief executive to first resolve the airspace issue before rushing into a bet of HK$142 billion. Chief Executive Leung Chun-ying made an even more irrational plea: the public should first support the project, and the technical problems could be solved later, he said. His administration does not have a track record of getting the job done to make his call credible. Leung’s remarks are tantamount to admitting that there is no agreement on the third runway. If mainland bureaucrats are so eager to enhance the facility, they would have done so by now. Who has been standing in the way? It may have been the Shenzhen airport operator, the Guangdong provincial authority, the Civil Aviation Administration of China, the People’s Liberal Army, or other interests. Their agendas are very different from ours. Even if we agreed to take a blind leap of faith with Leung, Hong Kong would still be in a weak negotiating position. Once construction has started on the runway, the Airport Authority will have passed the point of no return. The Chinese interests are well aware of this. If airspace problems remain unresolved, the project would become a white elephant and the Airport Authority would face deepening financial liability. Our mainland competitors would be in a good position to demand that Hong Kong give up some of its valuable civil aviation rights in return for access to airspace. None of our neighbouring Chinese cities can claim to be international aviation hubs. It would be a different story if they could lay claim to part of our rights for bilateral negotiations with other countries. That would spell the end of Hong Kong as a leader in aviation. It is enshrined in the Basic Law that the Hong Kong government should “take measures for the maintenance of the status of Hong Kong as a centre of international and regional aviation”. Yet, in reality, neither the government nor the Airport Authority has any realistic plan to keep Hong Kong ahead of its neighbours. Instead of relying on an uncertain third runway a decade later, we should take immediate steps. Any stipulations in the 2007 agreement that benefit Hong Kong should be translated into action without delay. Failing that, we should at least begin to look at other options, such as levelling the hilltop close to Chek Lap Kok, to enable more frequent take-offs. Only such measures can make us less reliant on the mainland and thus in a better position to negotiate.